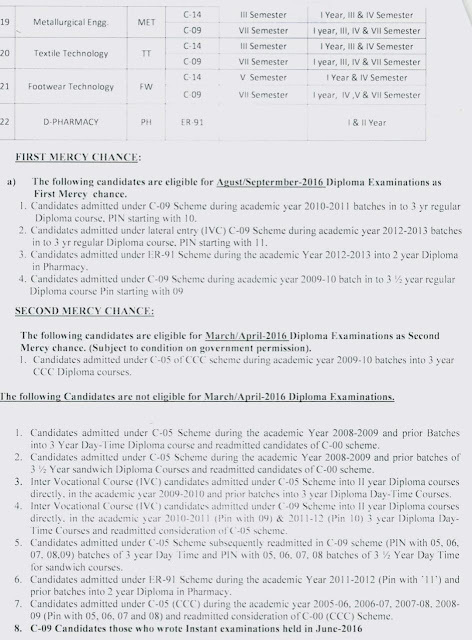 Home / ap / c09 / c14 / diploma / ece / eee / manabadi sbtet time tables / nov / november / oct / october / polytechnic / sbtet / sbtet world / telangana / ts / TS SBTET DIPLOMA EXAMINATIONS NOTIFICATION OCT/NOV 2016. TS SBTET DIPLOMA EXAMINATIONS NOTIFICATION OCT/NOV 2016. October/November-2016 - Notification – Regarding. from tentatively 18-10-2016 for the courses as mentioned in the Notification. sessional marks and certify that the candidate put up the required attendance to appear for the examination. refundable.) The candidate has to obtain a paper receipt after the payment of the fee. 2. A/ AEI/C/ CM/CCP/CT/EC/EE/ GT/HS/ IT/ M/ MNG/PKG/FW C-14 5th Semesters. II. SUPPLEMENTARY EXAMINATION FOR BACKLOG CANDIDATES. 1. 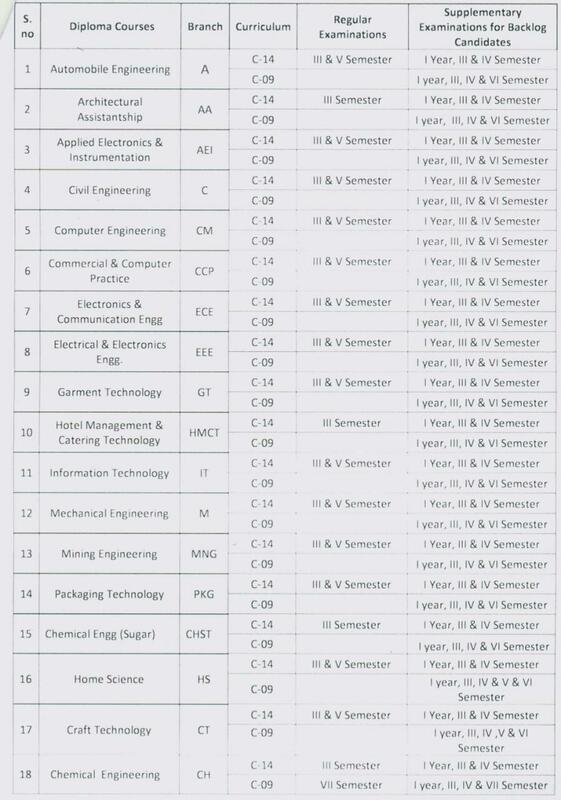 A/ AA/ AEI/C/ CM/CCP/CT/EC/EE/ GT/HS/HMCT/ IT/ M/ MNG/PKG/CH/ CHST/ MET/ TT/FW C-14 I Year and IV semesters. 2. A/ AA/ AEI/C/ CM/CCP/EC/EE/ GT/HMCT/ IT/ M/ MNG/PKG/ CHST - C-09 I Year, III, IV and VI Semesters. 3. 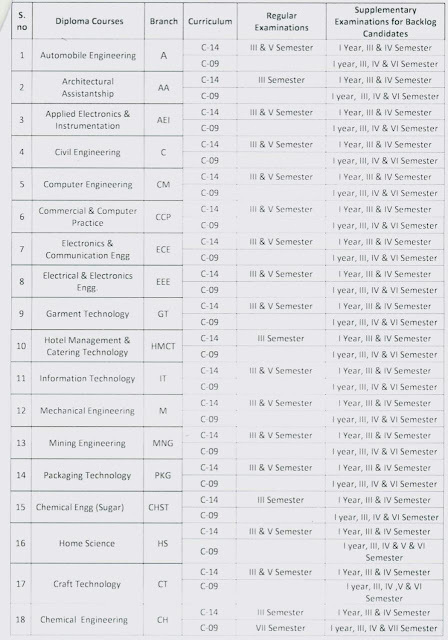 FW I Year, IV, V and VII Semesters of C-09 Scheme. 4. CT/HS C09- I Year, III, IV, V and VI Semesters. 5. CH/MET/TT/ C-09 I Year, III, IV and VII Semesters. 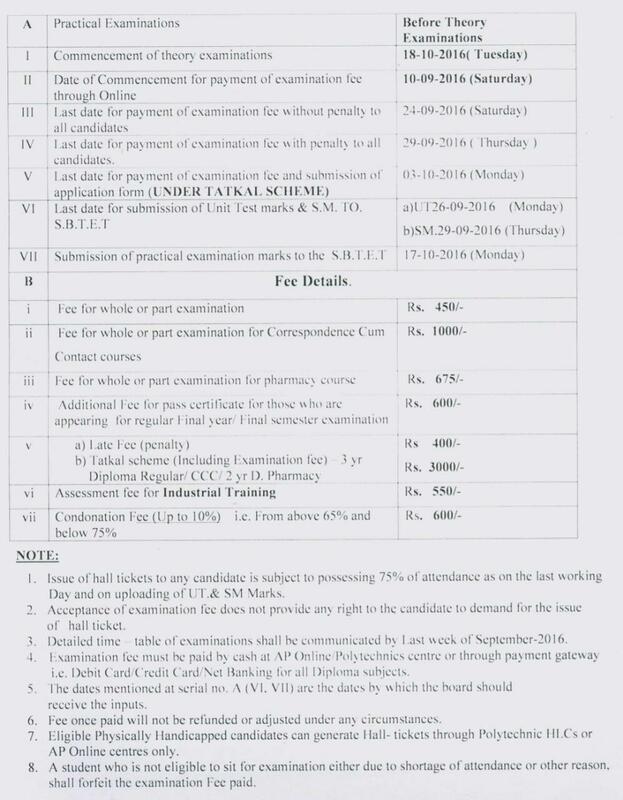 The Principals of the concerned Polytechnics/institutions where Regular exams are being conducted are requested to ensure in time completion of the syllabus i.e. on or before 29-09-2016 as per the academic calendar. 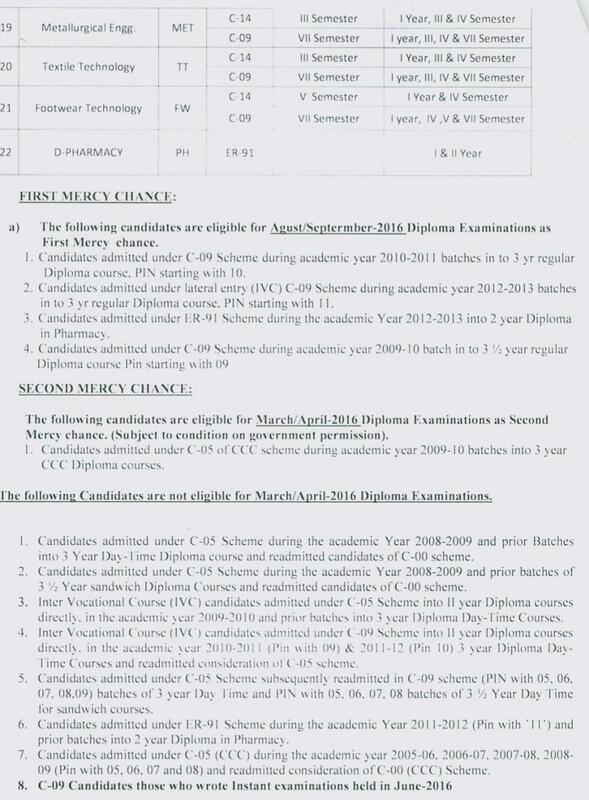 A copy of the Notification is to be displayed on the notice board of the Institution for information of the candidates and wide publicity shall be given among the students by circulating a copy of the Notification and the memo in the reference 1st cited into the class rooms. Candidates who possess 75% of attendance only should be permitted to appear for the Regular Examination and if any candidate does not put in the required percentage of attendance he/she shall not be permitted to appear for the examination. However the Principals are empowered to condone the shortage of attendance upto 10% based on Medical Grounds only, on production of supporting material of such claim and after collecting the necessary amount of penalty from the candidates. The details of candidates eligible for condonation and detained candidates list are to be uploaded to the fee payment portal by 18-09-2016 by considering the presumptive attendance for the remaining period. The hall tickets for the condonation candidates will be generated after payment of condonation fee through the AP Online/payment gateway i.e. Debit card/Credit card/ Net banking before 24-09-2016. Condonation fee payment facility is provided in the fee payment portal. Principals are requested not to take any DDs towards condonation fee. The principals are further requested to upload the detained candidates data in the Diploma student portal so as to restrict the generation of hall ticket for the candidates who are not eligible to appear for the examination due to lack of attendance. For the regular candidates the hall tickets will be generated after closing date of fee payment and after verification of their eligibility. The principals are requested to ensure that the Hall tickets will not be issued to the candidates who are detained for shortage of attendance even though they paid the examination fee. The URL for online examination fee payment is http://ousbtet.net/dofpportal The User ID and Passwords will be kept in the Poly login at HOS login. last working day under any circumstances. to the candidates by post.